Given the opportunity, the Resident Evil movies always snap back to the image of star Milla Jovovich holding two guns out at just above chest level, arms locked at the elbows, mouth pinned into a snarl. There are something like a half-dozen variations on this pose in every Resident Evil flick, often presented in plastic super-slow-mo, which makes Jovovich look like a life-size action figure—which is fitting, because Resident Evil is the definition of a toy-box franchise. Some context: The title Resident Evil comes from a long-running survival horror Capcom game series (called Biohazard in Japan), as do many of the movies’ monster designs, place names, supporting characters, and basic plot points. Still, it would be a bit of stretch to say that the movies—all five of which have been written and produced by Jovovich’s husband, Paul W.S. Anderson—are out-and-out adaptations of the games, and their most significant overlaps with the Capcom series come across as little more than fan service. That having been said, the Resident Evil movies do take a lot of their cues from the stuff of gaming. It’s where they get their sleek, geeky sense of firepower-based cool and their structures, which are predicated on boss battles, navigable environments, and restarts. They might not be straight adaptations of the Resident Evil games, but they’re video game movies through and through—a major sticking point for critics in an era when movies are only ever compared to games pejoratively. Besides the video game thing and a general sense of filmmaking fun, what the Resident Evil movies have going for them is a sense of subterranean claustrophobia dosed with a distrust of corporate power and a focus on impromptu groups and unions. (Anderson grew up in a coal-mining family; draw conclusions as necessary.) They work in that old B-movie tradition in which bands of survivors—invariably led by Jovovich, the most credible female action hero to come out of Hollywood—have to put up with each other in order to get from point A to point B. The series’ best entries—the fourth and fifth, both directed by Anderson himself—are pulpy sci-fi slice-’em-up flicks distinguished by their sharply staged action and the ways in which they play around with viewer perspective and their own convoluted mythos. They are lean and lively and fun and totally unpretentious, and, creatively and commercially speaking, they’re the closest thing to a bona fide success to come out of the game adaption gold rush of the 2000s—the days of Doom, Hitman, and the Uwe Boll tax write-off. They even have a poetry to them. For better or worse, Resident Evil is the movie where Paul Anderson, up-and-coming genre stylist, became Paul W.S. Anderson, widely maligned director of video game adaptations and movies that feel like video game adaptations. Anderson’s work has an unusual relationship with film criticism, because, while his movies—most of which don’t screen for the press—get drubbed by most reviewers, they also enjoy a serious cult following among a distinct subset of critics. (I presume that part of it has to do with the fact that Anderson doesn’t make the kind of movies that are supposed to be good, and he doesn’t wink about it either.) Believe it or not, but, for the last couple of years, a fractious debate—about what it means to appreciate action movies, and the meaning of the word auteur—has been making its way through film criticism, and much of this debate is centered on the Resident Evil series. Given carte blanche by Capcom, Anderson ended up making a pastiche of zombie horror, B-sci-fi, and Through The Looking Glass that was supposed to function as a prequel to the games, but ended up spinning off into its own parallel-universe series. The Resident Evil films constitute something like an auteur piece, in which continuities and references to the source material only matter insofar as they figure into Anderson’s established set of interests and skills, which include, but are not limited to: fast-paced stories of the “escape from…” variety; one-against-dozens showdowns; deathtrap settings; references to Lewis Carroll, especially Through The Looking Glass; and getting Jovovich to look and sound as cool as possible. The series is fixated on mazes, models, two-way mirrors, maps, simulated environments, memory wipes, clones, and all kinds of other things that don’t have a whole lot to do with its ostensible subject—i.e., Jovovich mowing down mutated zombies—but do fit neatly within a larger design based around space and repetition. It might not be a vision, but it’s certainly consistent, personal, and fully formed. Here, an amnesiac named Alice (Jovovich) passes through a secret door—hidden behind a wall-sized mirror, no less—on her way to an underground research facility overrun by zombies and controlled by a deranged artificial intelligence called the Red Queen. There’s a white rabbit, a decapitation—and so on and so forth. Resident Evil is the longest movie in the franchise—even though it doesn’t come within spitting distance of the two-hour mark—and the choppiest of the ones directed by Anderson himself. And yet, in between all of its jump scares and its modestly budgeted mayhem, there are moments of real elegance, sinister low angles and overhead shots that continually orient the viewer within the space of the Hive—the research facility of the Umbrella Corporation—and the secret train tunnel leading to it. This is the kind of stuff Manny Farber—the quintessential B-movie connoisseur of American film criticism—used to call “termite art”: unpretentious filmmaking that produces something akin to art through sheer, single-minded industriousness. For instance, in the interest of expediency, Anderson establishes Alice’s amnesia through graceful silent-movie shorthand, in a brief sequence in which she spots a note on a desk and then starts copying it, realizing after a few words that the handwriting isn’t hers. Resident Evil wasn’t a runaway hit, but its low budget made it very profitable, paving the way for a sequel: 2004’s phenomenally trashy Resident Evil: Apocalypse, which is more or less the movie most people expect a Resident Evil feature to be. Styled as the visual equivalent of second-tier nü-metal, it’s a barely coherent series of wire-assisted stunts, canted angles, and disruptive references to the games—a movie in which Alice is introduced crashing through a cathedral’s stained glass window on a motorcycle. Anderson backed out of directing the sequel, instead giving the job to Alexander Witt, a first-timer who’d had one of those odd career trajectories that are unique to cinematographers, crewing on everything from The Serpent’s Egg to Leonard Part 6, before becoming an in-demand second-unit director of photography. Apocalypse remains his only feature as a director, and it’s the only film in the series to make an overt attempt at connecting with the Capcom franchise. 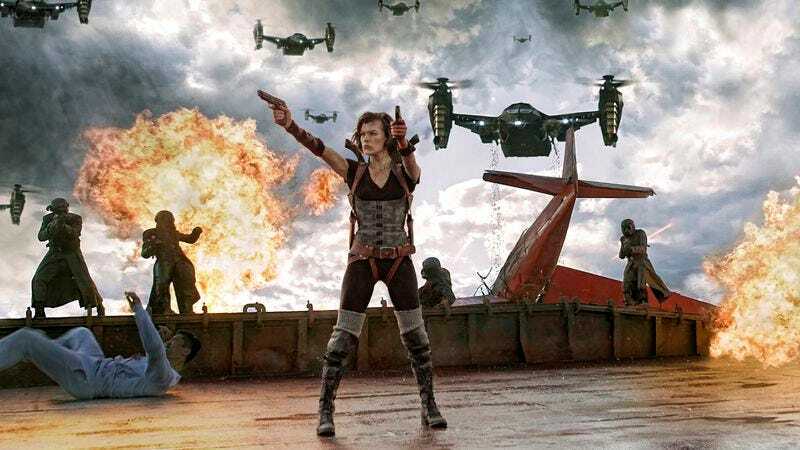 For the most part, Apocalypse was an opportunity for Jovovich—who came up with the idea of setting the story during a heat wave, so that her character would be more scantly clad—to look good while shooting guns at rubber-masked stuntmen. And yet, even here, in the franchise’s weakest entry, there are moments of sharp, B-movie poetry—termite art, like the shot of a shambling zombie being reflected in the visor of a fallen policeman’s helmet. Anderson had wanted to make a female-driven action flick since he arrived in Hollywood in the mid-1990s, and with Resident Evil, he managed to set off a whole series of them. It’s Alice’s sinewy physique—her broad shoulders, her muscular arms—that gets ogled here. Consistently throughout the series, she gets counterposed with other women: Rain Ocampo (Michelle Rodriguez) in the original and in Resident Evil: Retribution, Jill Valentine (Sienna Guillory) in Apocalypse, Claire Redfield (Ali Larter) in Resident Evil: Extinction and Resident Evil: Afterlife. Extinction is the better of the two non-Anderson-directed Resident Evil movies, and arguably even better than Anderson’s original film. Directed by Russell Mulcahy—the smoke-and-dust-obsessed stylist behind Highlander and The Shadow—and set around a facility hidden in the desert of the American Southwest, it follows what, by this point, had become the formula of the series. There’s a disorienting opening—a repeat of the original’s introduction of Alice, followed by her apparent corpse being dumped into a concrete ditch full of lookalikes, later revealed to be clones—and then the build-up to a collision, with loner Alice quickly joining forces with a convoy of survivors. The non-numbering of the sequels only reinforces the impression that they’re all variations on the same story about a deadly, Dietrich-faced woman leading a motley crew from point A to point B, each new version adding more layers of Byzantine backstory. Point B, in this case, is a rumored safe zone in Alaska, which involves a pit-stop in a deserted Las Vegas—its streets half-buried in sand—and a run-in with the Umbrella Corporation, now run by Albert Wesker (Jason O’Mara; Shawn Roberts would play the character in subsequent films). By this point, the series’ internal mythology had become incredibly convoluted, with Alice as a super-human with psionic powers whose DNA held the key to a cure to zombie plague that had affected all life on Earth. What’s remarkable, then, about all of the Resident Evil movies is how clearly plotted they are, setting up a clear goal and a limited set of characters at the beginning. For all of their clones, corporate conspiracies, and memory wipes, the movies proceed in straight, diligent lines. 2010’s Resident Evil: Afterlife marked Anderson’s return to the director’s chair and his first foray into 3-D. With its fixation on clean geometric lines and its crisp sense of space, Anderson’s style was tailor-made for the stereoscopic format. Afterlife would be his first film with Glen MacPherson, the Canadian cinematographer who’s shot all of his subsequent movies; it’s still one of the best-looking 3-D movies of the modern era, continually using the format to define and reveal space. Space is plot here, with Alice at first helping a group of survivors break out of Los Angeles prison where they’ve holed up while hordes of the infected undead claw at the walls, and later traveling further and further into the interior of a massive cargo ship. Anderson’s sense of action and movement had substantially improved since the original Resident Evil, and Afterlife’s opening—in which Alice leads a small army of clones in an attack on the Umbrella headquarters—is a small marvel of choreographed cheesiness, a slow-motion tableau of throwing stars and sub-machine gun fire. It never comes across as kitschy or campy, in part because Anderson never gives the impression that he thinks he’s an artist. He’s organizing and presenting entertainment—and that, in and of itself, is a kind of art. Which brings us to Resident Evil: Retribution—the franchise’s most recent entry (Resident Evil: The Final Chapter is due in 2016) and the point where all of its visual motifs converge. If Anderson has a masterpiece, this is it. Set inside of a massive underground facility composed of simulated environments (Tokyo, Moscow, an American suburb) and populated by brain-washed clones, it once again pits Alice against the Red Queen, here functioning less as a generic, HAL 9000-style amok AI, and more like a game designer. Exteriors are revealed to be interiors and characters are revealed to be copies; there are two different Rain Ocampos—neither the “real” one—with polar opposite personalities running around. It would be a mess, if it weren’t for Anderson’s style, which is focused on organizing action and orientating the viewer. From the countdown at the end of the first Resident Evil to the pile of failed Alices at the beginning of Extinction, the series had always played around with integrating the mechanics of gameplay; here, they’re front and center, with a major emphasis on the play. The horror aspect has all but been abandoned, in favor of outrageous images that toy with viewer preconceptions about space and character: one outdoor environment leading into another, a sky “rebooting,” a false Alice being abruptly killed off. It’s a kind of unaffected, perhaps inadvertent poetry that’s unique to B-movies, and something that Resident Evil does better than any other film series. Come for the zombie slicing, stay for the geometric compositions and phantasmagoric tableaux.